I've tried making this soup (and broccoli cheese soup) off and on over the years, but I was never totally satisfied with the result. Most recipes have cornstarch or flour, which, of course, I wanted to avoid. It seemed that if I put in enough cheese for the soup to really taste cheesy, it was kind of gloppy and tending to separate upon reheating. In a large pot or Dutch oven (it's best if it holds about 3 quarts), heat the oil and cook the onion until it begins to soften about 4 or 5 minutes. Add the garlic, and cook another 30 seconds or so. Add the cauliflower, and stir. Then add the chicken broth, herbs, and spices. Cover, and bring to a simmer. Cook until the cauliflower is soft, about 10 minutes. Remove the bay leaves. While the vegetables are cooking, grate the cheese, and toss it with the cornstarch. When the cauliflower is soft, puree the soup with an immersion (stick) blender if you have one. If not, puree in batches in a regular stand blender, but be careful not to blend too much at a time—hot liquids can "explode" when blended, spewing hot liquid all over the place. Add the cream and the cheese. Stir as the cheese melts, and then add the mustard. Taste and adjust salt and spices. Garnish with chives, parsley, or bacon crumbles. This soup is also great with ham or greens. To be clear, it's not bad without the cornstarch, it's just less good, especially on reheating. 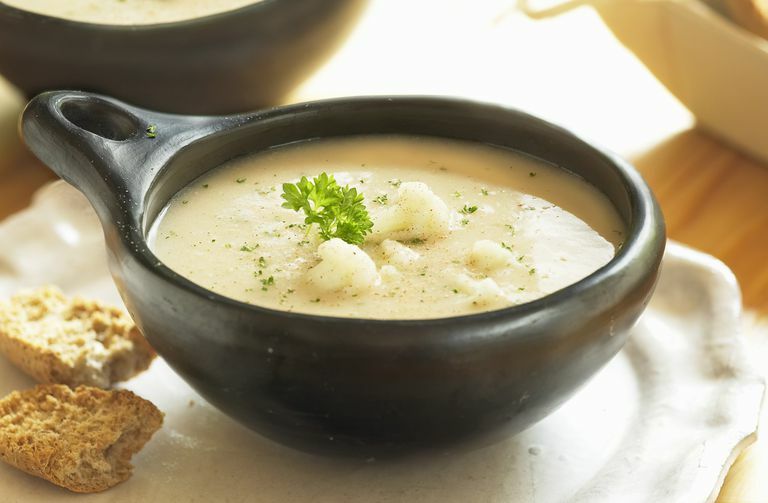 Other things you can do are to use about half the amount of cheese or no cheese—the soup is actually quite good as a creamy cauliflower soup. You might want to add a touch more cream in that case. Also, you can try adding some cream cheese as this tends to have a stabilizing effect in some sauces.